Steve Welch serves his way to victory on Day 3 in Mexico. GUADALAJARA, Mexico - Emmy Kaiser started her quest towards a Parapan American medal with a quarterfinal match against Natalia Mayara of Brazil on Tuesday. Kaiser made quick work of Mayara, staying on serve and giving her no room to get comfortable. Kaiser was all over the court, covering every ball Mayara tried to spray away from her. After several deuce games that went back and forth, the young Cincinnatian held on every time. The #1 ranked American had what it took all match long and looked relaxed and prepared for her first ParaPanAm match. The match took Kaiser only 43 minutes, dispatching her South American opposition, 6-0, 6-1. After the match Kaiser relayed, "I felt good and played well, that’s what I wanted to do in my first match of this tournament." Kaiser now moves on to the semifinals on Wednesday against Angelica Bernal. Mackenzie Soldan took to the courts on Tuesday looking to extend her run at the 2011 Parapan American Games. Soldan started off slow, allowing Johana Martinez of Colombia every opportunity to dominate and take the first set 1-6. In the second, Soldan came alive showing her crafty skills and pushing the chair to reach every ball. Her opponent seemed out of sorts and could not respond to the renewed energy Soldan brought to the match. Soldan served well and took the second 6-0. It was on to another deciding third set for Soldan, but her spirit and energy from the second set were apparent right from the start. Soldan stayed consistent keeping balls in play and serving with authority. Her control and desire to reach the semis was too much for Martinez as she took the set and match 6-2. After the match when asked how it felt to reach the semis of such a prestigious event, Soldan replied, "It feels really good, I played hard in both matches and I am seeing the results of my determination and will to win." 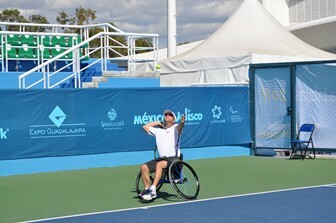 Steve Welch started his quarterfinal tilt against Mauricio Pomme with fast hard strokes against the veteran wheelchair tennis player. He served well and used his speed to overtake Pomme’s skilled placement. The American took the first set in 30 minutes, 6-2. In the second, Pomme came out stronger going back and forth with Welch and inching his way back into the match with three straight games to even the match at 5-5. He briefly went up 5-6 before Welch battled back to force a tie-breaker. In the tie-breaker Welch stayed on serve keeping the ball out of the Brazilians reach and taking the set and match, 7-6(4). At dinner, Welch commented how it felt to still be in the tournament: "Happy to still be alive in the event, tomorrow is another day!" The last singles of the day would prove the toughest for Team America as Jon Rydberg took on world #19, Gustavo Fernandez. Fernandez is a rising star on the tour and was in great form in the first set, jumping out to a quick 3-0 lead. Rydberg battled back with his power game and drew the match even at 4-4, but it wasn’t long before Fernandez pushed into another gear taking the set 4-6 while looking faster and more efficient than his American opponent. In the second, Fernandez continued on his quick pace, jumping out to a 4-0 lead. Rydberg battled in each game and finally broke the Argentine’s games streak to pull a little closer at 4-1. Unfortunately for the reigning Parapan Am Gold Medalist, Fernandez was too tough on this Tuesday and took the set and match 6-1. Rydberg bows out of the singles competition and will now look to doubles for a Parapan Am medal. In the men’s doubles Rydberg and Welch defeated Canadians, Phillippe Bedard and Joel Dembe 6-4, 6-3. On the women’s side of the competition Kaiser and Soldan teamed-up and defeated Esperanza Belmont and Claudia Taboada. Both teams head to the semifinals on Wednesday with matches against Chile and Colombia, respectively.